W&T: Wrap and turn. On knit row, bring yarn forward between the needles, slip next stitch purlwise, bring yarn to back, slip the stitch back to the left needle and turn work. On purl row, bring yarn to the back, slip the next stitch purlwise, bring yarn to the front, slip the stitch back to the left needle, and turn work. kf&b: Knit front and back. Knit into the front of the stitch, then into the back of the stitch. More details here. Round 2: K1, M1, knit to last st on Needle 1, M1, K1, K1, M1, knit to last st on Needle 2, M1, K1. 4 sts increased. Round 1: K16, M1, k16, knit 3 sts from Needle 2 to Needle 1, knit until 3 sts before the end of Needle 2, move last 3 sts to Needle 1. 39 sts on Needle 1. 26 sts on Needle 2. Place sole sts on scrap yarn or stitch holder. 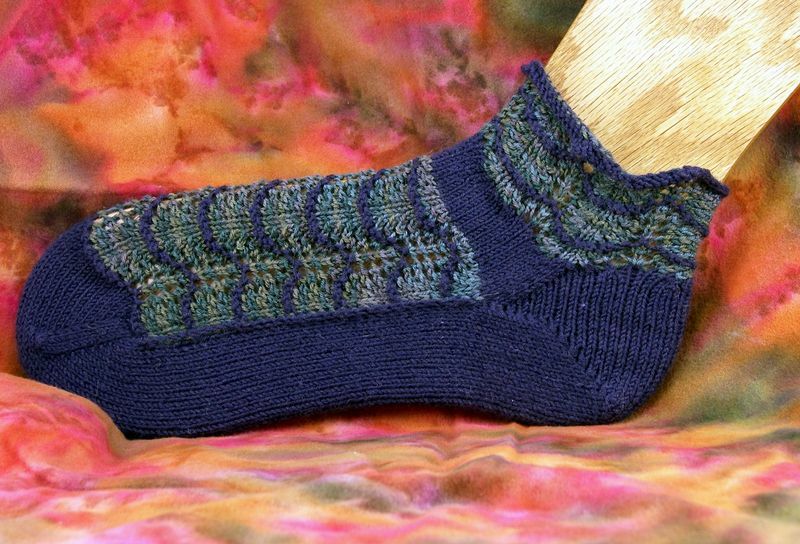 Work Instep Ripple Lace until instep measures 7” from tip of toe, approx 6 ½ repeats, ending on an even row (Row 6). You can either cut the MC yarn, or just twist the two yarns together on the WS before each RS row to carry the MC yarn upwards (see Shenandoah Socks for more details). Make sure that the last MC and CC slipped sts are snug; they can become loose waiting until the next MC or CC row, but don’t pull them too tight. Row 1(MC): Sl 1, knit to end. Row 2(MC): Sl 1 , knit to end. Row 3, 5, 7, 9(CC): Sl 1, [k2tog twice, *yo, k1* three times, yo, sl 1 k1 psso twice, k1] three times. Row 4, 6, 8, 10(CC): Sl 1, purl to end. When instep reaches 7” from toe, place instep sts on scrap yarn or stitch holder and return sole sts to needle. Row 1: Sl 1, purl to the end. Row 2: Sl 1, knit to the end. Sl 1, purl to last st, W&T. Knit to last st, W&T. Purl to 1 st before end, W&T. Knit to 1 st before end, W&T. Purl to 2 sts before end, W&T. Knit to 2 sts before end, W&T. Continue working 1 fewer stitch each row until there are 10 sts between the wraps, ending after a knit row. I use Misocrafty’s Short Row Heel Tutorial to eliminate holes, but feel free to use your favorite method of picking up wraps in the next section. Purl to the first wrap. Pick up the wrap with and leave on right needle. Purl the wrapped stitch and pass the picked up wrap over, as in a psso. Wrap the next stitch again, turn. Knit to the first knit wrap, pick up the wrap and leave on right needle. Knit the wrapped stitch and pass the picked up wrap over, as in a psso. Wrap the next stitch again, turn. Purl to the first purl wrap. Pick up the two wraps and leave on right needle. Purl wrapped stitch and pass wraps over, as in a psso. Wrap the next stitch again, turn. Knit to the next knit wrap. Pick up the two wraps and leave on right needle. Knit wrapped stitch and pass the two wraps over, as in a psso. Wrap the next stitch again, turn. Continue working wraps until all sts have been worked, ending on a RS row. 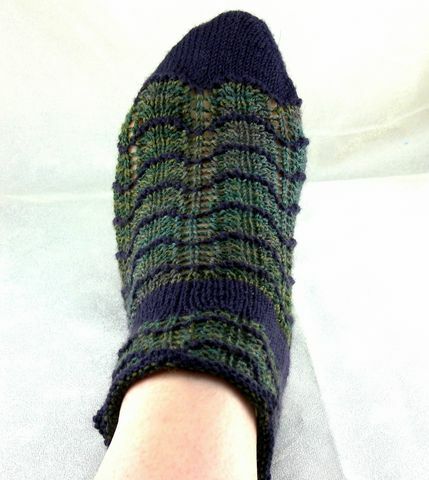 Pick up and knit through the back loops 5 sts along the heel flap, one in each slipped stitch on the edge. Pick up and knit through the back loop 1 stitch in the corner. Place marker. Return instep stitches to needle. Knit 19, k2tog, knit to end of instep. Place marker, pick up and knit through the back loops 1 stitch in the corner and 5 sts along the flap. K 13. Place marker for beginning of round (center of the heel.) 38 sts on sole. Next Row: K1, k2tog, k3, k2tog, k3, k2tog, k1, knit across instep, k1, ssk, k3, ssk, k3, ssk, k1. 60 sts. Join CC and work Leg Ripple Lace until desired length. Shown 2 ½ repeats, starting on Row 7. Row 3, 5, 7, 9(CC): [k2tog twice, *yo, k1* three times, yo, sl 1 k1 psso twice, k1] around. In MC, knit 1 round. Next Row: K5, in next stitch kf&b twice, kf (5 sts increased),*Knit 11, in next stitch kf&b twice kf*4 times, k6. 85 sts. Thank you so much for the beautiful patterns.Your generostiy made my day,not everybody has the money fo pay for patterns.Thanks again,can’t wait to get started. You’re welcome! I’m glad you’re enjoying them.